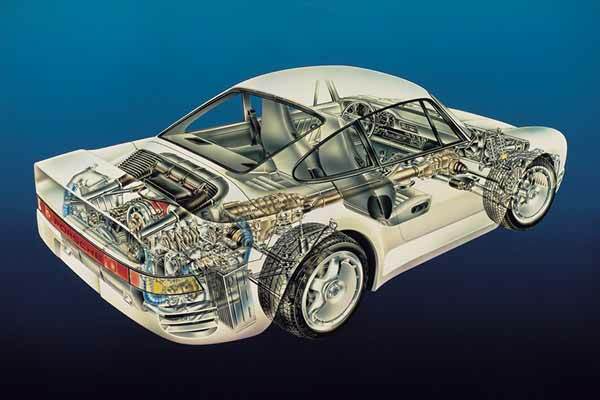 Porsche 959 technical cutaway – © Dr. Ing. h.c. F. Porsche AG. The Porsche 959 was originally developed to allow Porsche to compete in the Group B motor racing series. While the race series remained still-born, the 959 road car was among the fastest and most technically advanced road cars of all time. Mounted at the rear of the car, under aluminium and fibre-glass reinforced body panels, sits a 2.85 litre, 4-valve per cylinder, all-aluminium evolution of the flat-six engine cooled by air and water that was originally developed for the 956 racing car. The story didn’t end there though. Turbo technology came with it’s drawbacks in the nineteen eighties. The biggest being turbo lag. This delay between the driver putting their foot on the throttle and the time taken for the turbo to spin up to speed and deliver it’s thrust, could easily catch out the most experienced of drivers. Especially in a rear-engined sports car like the Porsche 911 Turbo (930 Turbo). To try and overcome the dreaded turbo lag, the 959’s engine used not one but two sequential turbochargers (developed in-house by Porsche). The first turbo was designed to work at low revs, while the second provided extra power at higher revs. The idea was to deliver the same amount of thrust but with more progressive power curve. Wound up to 6500rpm, the 959’s 2.85 litre engine produced 450bhp, driven through a six-speed gearbox and an advanced four wheel drive system that could vary the amount of power fed between the front and rear wheels. 450bhp + 4wd + rear engine grip = a 0-60mph time of just 3.6 seconds and on to a top speed of 197mph (making the 959 the fastest production car in the world in 1986).